Important Note: Each additional IP address will cost €2 excluding VAT, per month. Once complete, click Add IP Address Assignment. The final step then to have your VM be able to use the new IP address. In addition to the instructions below - if you are running a control panel interface like Plesk on the Cloud VM, you will have to manually assign your new IP address in the control panel interface itself. For Windows templates you need to setup the IP address manually on the network adapter, if you require assistance doing so please submit a support ticket. Should you have the need to rebuild the network - on the Cloud VM (as below), or you do so as part of the process, the existing IP addresses on your Cloud VM will be removed and then re-added to the server (inside Windows). If this is the case, you may need to manually re-associate the IPs to their respective services. You should try to keep a list of currently assigned IPs and their respective services. This is a knock on effect, as to how IP address are automatically assigned to the network interface in Windows - where all IPs are listed as source IPs. This can have a negative effect on previously Whitelisted IPs/services e.g. payment gateways in use. You run the command, from within the command prompt - in Windows, and as an Administrator. The IP address 111.111.111.111 should be replaced with the IP address you wish to remove as a source IP. The Subnet Mask should match the same subnet mask as the IP address assigned. For Linux VM's, you can add the IP manually - or you can use the Rebuild Network feature (below) to apply the IP. You can use this feature to rebuild the network stack, for the Cloud VM, to ensure it has detected the new IP address - however, even after rebuild the network, it may still be a requirement to reboot your Cloud VM in full. If you trigger this feature, it can take roughly 1 - 2 minutes to take effect and their will be downtime for the duration of the process - though in most cases, once the process is triggered, the outage only lasts around 30 seconds. Rebuild Network on the IP Addresses screen after you allocate the new IP address. 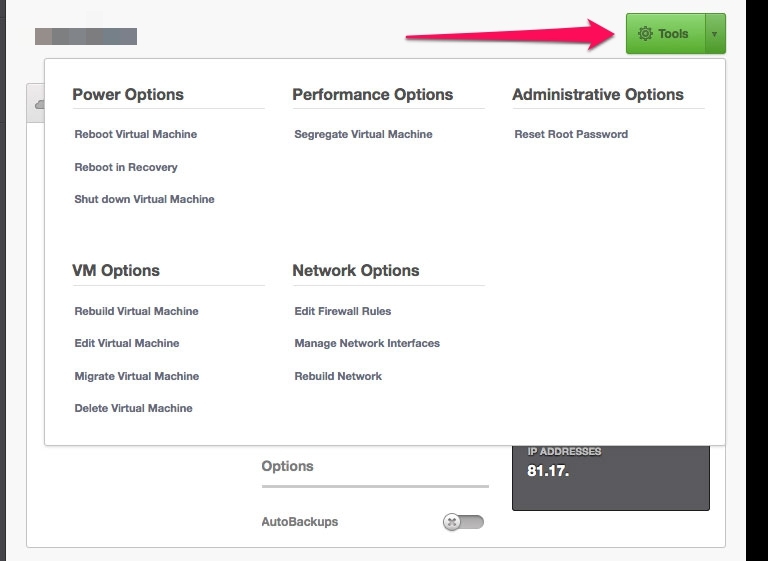 Virtual Machines > (VM Name) > Tools > Network Options > Rebuild Network. See the screenshot below, to determine where this is in the control panel.